While conservative interpreters might believe that prophets were predictors and progressives believe the prophets to be simply social advocates, Walter Brueggemann argues that the prophets were “emancipated imaginers of alternative.” Emancipated from the dominant thinking of their societies, the prophets imagined an alternative reality and invited listeners to join them in their commitment to that new reality. In this collection of studies, popular biblical scholar Walter Brueggemann explores the Major Prophets, the Minor Prophets, and the prophets of the Persian Age. 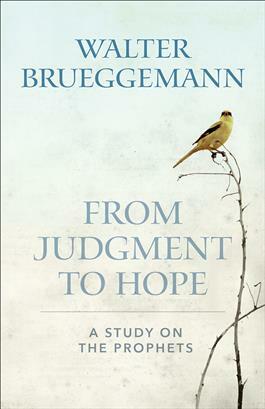 By highlighting the common themes of judgment and hope found in the prophets’ messages, Brueggemann invites readers to consider what those messages mean for us today. Questions for reflection conclude each chapter. From Judgment to Hope is suitable for individual or group study.